How Much Does Access Control Cost Per Door? A Locksmith Answers. Access control pricing varies dramatically. As a Locksmith company, we deal mainly with small businesses and here access control usually runs from $500-$2000 per door. It is very feature dependent. Systems can climb into several thousand per door for large-scale commercial businesses. What Types of Access Control / Keyless Entry Systems are Available? There are primarily three major categories of access control systems. The first is the more traditional wired system. In a wired system you typically have a power supply, a controller that triggers whatever releases the door, and a software program so that you can add codes, cards or FOBs to access the door. These are the most expensive Access Control Systems because of the wiring, multiple electrical components and labor/installation cost. They can run up to several thousand dollars per door. But they are very beneficial if you have a large number of doors to access and you want to program/control all of those doors from one central location or online. The second category, and very popular with small businesses, are Standalone Access Control Systems. Usually everything needed for the system is contained within one device, such as a lock installed on the door, that allows programming for pin code and/or FOB access. Stand-alone system locks themselves are pretty expensive (ranging anywhere from $400 to over $1,500 in a commercial application with commercial grade locks). However, the cost savings comes from the fact that installation is much more simple, and you don’t have nearly as many components as you do in a wired system. So it’s the lock itself that drives price. The standalone locks can look big and clunky, but this trade off can save you hundreds and thousands of dollars. The main disadvantage of this category is that it really is only good for a few doors. This is because each lock needs to be independently programmed at the lock itself and cannot all be controlled from one location. My favorite stand alone products can be found on Amazon through the following links: Alarm Lock Trilogy (see on Amazon), Marks I-Qwik (see on Amazon) or Schlage NDE (see on Amazon), and Yale (see on Amazon) . Note: there are some standalone locks that enable you to control them from one location but additional components are necessary and, for only a few doors, make them financially undesirable. In recent years a third category has emerged. Especially effective for small businesses it is a hybrid of the above two categories. 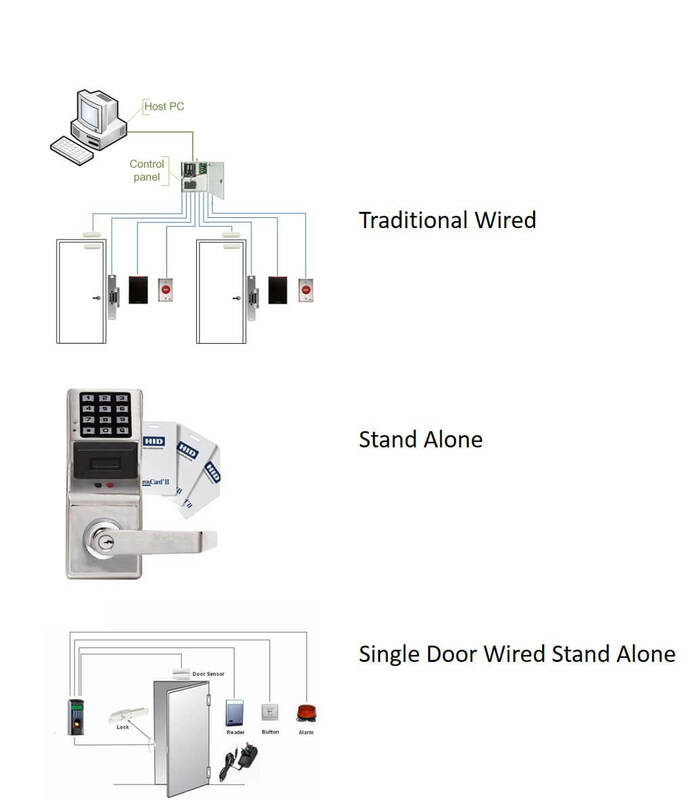 It is similar to the stand-alone door access category in that its primary use is for a single door but similar to wired systems in that there are multiple components on the door working together, as opposed to a single lock. This means that the components need to be wired together with someone that understands low voltage wiring. But those low voltage lines aren’t run throughout a building for cost savings. In most cases, these systems can simply be plugged into an outlet near the door. These systems really shine if there are only a few doors. One would choose these over the standalone systems because of some additional capabilities that they offer (mainly the ability to remote buzz people in). They are priced only marginally higher than standalone system because while the individual components are less, the labor to install is just a little higher. You can buy a complete system as a kit through Amazon – a wide variety are available (see on Amazon). 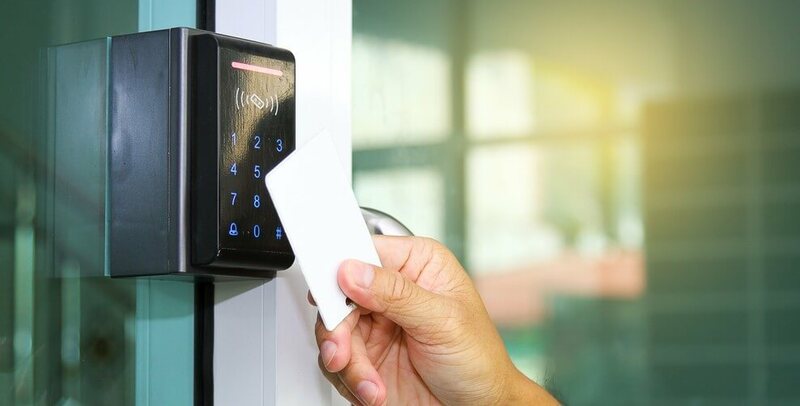 For a more detailed description of the Components of an Access Control System and comparison of stand alone access control locks available, check out our post. In a traditional door, some mechanical or physical action releases the door from the frame so that the door swings open. Typically unlocking a lock with a key. In Access Control Systems this is done electronically after credentials have been presented to the door granting someone access. Magnetic locks (that hold the door closed via powerful electric magnets). 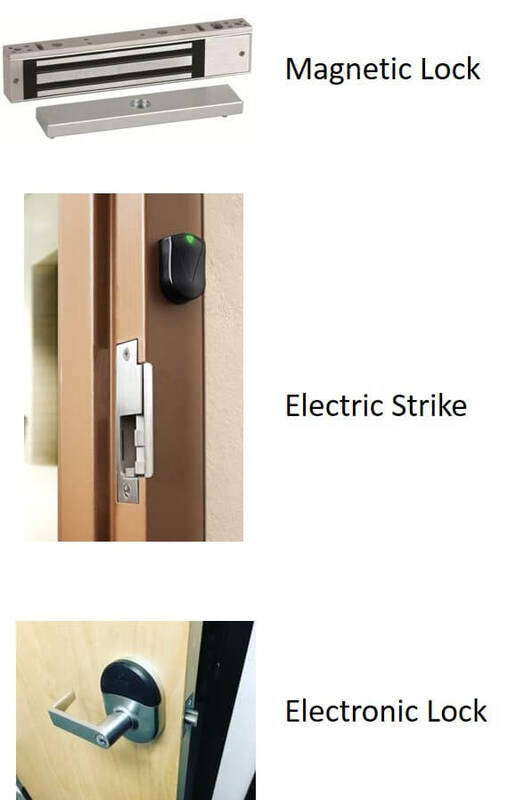 Electronic strikes (that release the door so it can swing freely even if the lock on the door has not been manually opened (turned). Electronic locks that release from their locked state without having to have a key entered. They will either retract or release from the locked position electronically so the door can be opened. There are several credentials that can be used in access control to release the electrical component security the door. Remotes – such as a buzz in capability to let someone in. PIN code – a 4-8 digit pin code assigned to employees to gain access. HID Cards or FOBS – held close to a reading device to release the door. What are Some of the Features of Access Control Systems? Scheduling – the lock is open or closed during specific hours / days. Card or FOBs instead of PIN code (the card is the credential that allows access). Software programming – setting up a computer that interfaces to the lock for automatic uploads, downloads, and user code / credential changes. Audit trail – the ability to track who entered and when. Wireless communication with the lock – codes, audit trails, etc… can be accessed from any browser. What are the Building Codes for Access Control? Building codes vary from town to town. You really do need to consult with your local fire marshal, locksmith company or building inspector to find out what codes are necessary in order to install access control on a given door. Ignoring or installing a system incorrectly will result in your being liable should anything occur. In general, everyone inside the building must have free egress by a single motion in order to leave the building in case of an emergency. That is, it only takes one action by a person to exit the door. For an Access Control door, this can either be through a manual action, such as pushing a panic bar or turning a lever to manually release the door, or an electronic action such as a “push to exit button” to release a magnetic lock. Every door must be exitable by every person without any key or special credential required. If the exit is by an electrical means, such as the push to exit button, many cities have code that requires a redundant system. So should one thing fail another thing will still allow customers to exit the building. The most common method is to have a motion sensor on the inside of the door. When somebody approaches the door the motion sensor releases the electronic component securing the door. Should that fail the push to exit button is included as a backup measure to get out. Even if your city does not require a redundant system to exit the building, it is in your best interest to do so because it is a very inexpensive add-on capability. Can I Install My Own Door Access Control? You can but it is not a typical do-it-yourself project for the inexperienced. Commercial systems are more complicated than residential and will require considerably more programming for the complex features. If all you want is a stand-alone keyless system with one user code that is accessible 24-7, then with the help of dealer installation videos or YouTube you should be able to handle the job. When you get into scheduling, multiple users, audit trail, etc….it’s considerably more complex even for stand alone system. Single door wired access control systems require a basic knowledge of low voltage electrical, understanding of tool usage, your city’s fire and building codes to prevent liability. Those without these skills should use or consult with a local locksmith for their access control installation. ACME Locksmith installs these all the time in Arizona and our prices are quite reasonable. Stand alone: either Alarm Lock Trilogy (see on Amazon), Yale (see on Amazon) , Marks I-Qwik (see on Amazon) or Schlage NDE (see on Amazon). Wired single door: a wide variety are available (see on Amazon). What Happens if an Access Control / Keyless Entry System Fails? Access control doors can be setup as either fail safe or fail secure. Fail safe means that the electrical component holding the door will release when power is removed. In this situation there is always power at the door “holding” the door locks. When power is removed, it unlocks. If a magnetic lock were holding the door and power went out, the magnetic lock would release so you people can exit the business. Fail secure means that the door will unlocks when power is applied. So when there is no power, the door stays secure. Which is chosen depends on the application but you should always include a mechanical method to secure the door for fail safe mode and a method to open the door mechanically for fail secure. As an example, a business may have a buzz in capability installed on their door to allow people in during the day. IF power fails during the day or at night in fail safe mode the door becomes unlocked. A mechanical method of locking the door should be left in place to account for this.